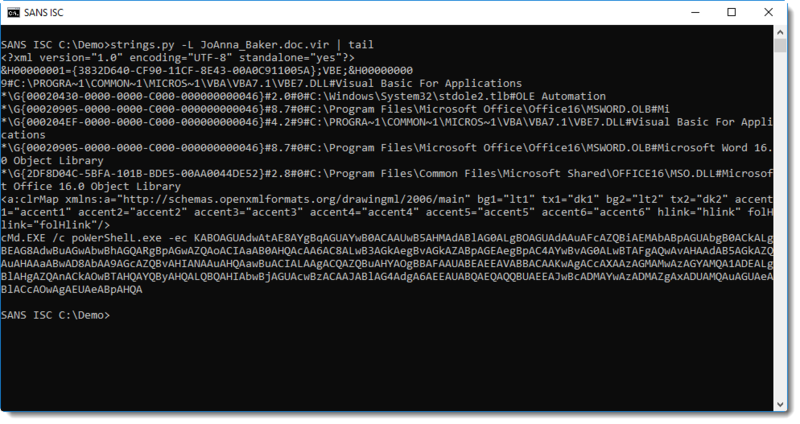 String analysis: extracting and analyzing strings from binary files (like executables) to assist with reverse engineering. It's a simple method, but still useful, if you don't have to spend hours sifting through all strings produced by the string tool. I have a tip to quickly find "interesting" strings: sort the output of the strings tool by string length. Start with the shortest strings, and end with the longest strings. Take for example the analysis of a malicious document, that involved many steps and requires good knowledge of different file formats. I developed my own strings.py tool, and option -L sorts strings by increasing lenght.